17 YEARS LATER, SLOW LEARNERS OR WHAT? The party which was to the fore in berating opposition to the treacherous and deceitful GFA with the cliché, “There is NO alternative,” has found there was an alternative. Sadly their alternative is not based on doing what is morally right, it is based upon political expedience. All the Unionist parties knew the IRA/MI5 movement was still in existence and they were happy to play along with the charade in order to fill their pockets with terrocratic loot. 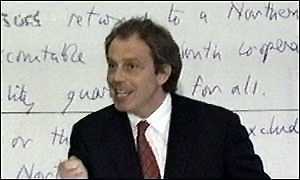 Who can ever forget Phony Blair’s five pledges. note particularly the 4th point! Psalm 55:11 Wickedness is in the midst thereof: deceit and guile depart not from her streets. CLAIMS HE IS INNOCENT BUT WILL NOT GIVE A DNA SAMPLE?